Charts for Apple Music’s most listened to songs are now available in the tech giant’s streaming service. Apple Music has 116 ‘top 100’ charts, including a global chart for every country that the streaming music platform is available in. The charts are currently rolling out through an update, according to Apple. Further, the charts are set to be updated daily at 3am ET/12am PT. Regarding subscriber numbers, Apple last reported that its music streaming service has 40 million users worldwide, while Spotify, which also offers a free tier, sits at roughly 83 million paid Premium subscribers. In Canada, Travis Scott’s ‘Sicko Mode’ holds the top slot, followed by Eminem’s ‘The Ringer,’ ‘Lucky You,’ and finally, 6ix9ine’s ‘Fefe,’ featuring Nicki Minaj and Murda Beatz. 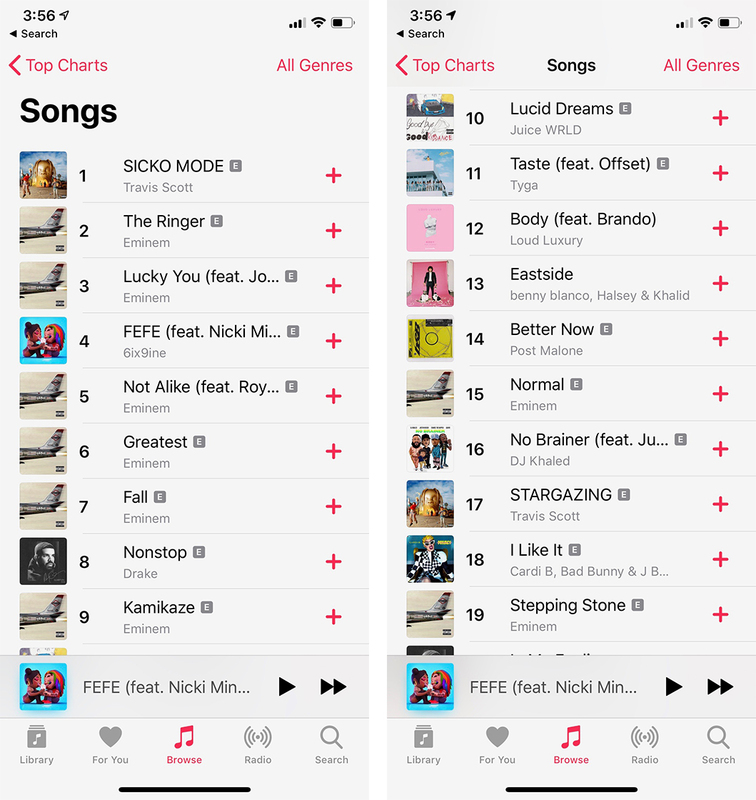 Apple Music’s new Charts section is located under the ‘Browse’ tab, as well as on desktop and mobile. A monthly Apple Music subscription costs $9.99 CAD per month for an individual plan.